Its been a while and plenty has happened. We left St Lucia for Tortola on the 9th of April about 340 miles. Melanie managed to get us an MPS spinaker for the trip. The first day was a great sail getting speeds up to 15 knots on Meltemia. Not being particularly skilled at these cruising sails that come in those stupid socks we could not get the sock down over the thing and managed to get a massive wrap when we tried to drop it. It took us about an hour to untangle it and get it down. The second day there was no wind and we motored the rest of the way to Tortola. Mel; I managed to convince them at the sail loft in St Lucia that our boat had a spinnaker that was in there loft. So with our new spinnaker we had our floating hotel room up to a amazing 15 knots. It was pretty funny though because it was actually what is called an MPS or a sort of asymmetrical kite, and came in a sock. Both having spend our time on racing yachts neither of us have ever used a sock, so we were pulling it out of the bag going what do you do with this!? We are thinking that the sock might accidently get lost. There is also no attachment for the tack on the deck so that we originally hooked it up to a forward leeward cleat on the bow – it looked pretty funny. We them hooked the aline from the tack through the forward windward cleat and back to a primary so we could adjust it like a spinnaker pole and then the hotel room really got cranking. You will be pleased to know that we are not completely foolhardy and for safety reasons (despite our great speed) took it down at dusk. Which turned out to be a wise choice as we managed to completely knot the thing around the furling headsail. But again don’t stress we managed to unknot it without to much problem. We had a good first nights sailing, but the wind dropped out in the early hours of the morning and we had to motor the entire next day and night arriving in Tortola at about 9.30 am. I have also decided that my new best friend is Auto, the autohelm, he makes life much easier on the long journeys, I couldn’t think of anything worse than hand steering all the way! You will also be pleased to here that at night we religiously safety harness ourselves to the boat no matter how clam the conditions. On the first night we saw little other boating traffic, maybe 1 or 2 ships off in the distance. The closer we got to Tortola and the Virgin Islands the greater the traffic esp. cruise ships at first they appear to be a glow of in the distance, eventually turning into floating cities, they closest one past by only a couple hundred meters away – very eerie, resulting in the need for careful watches. The cruise ship thing is huge here with some islands having up to 8 in a day. One of they funny things they do during the night is just go around in big circles so that the punters think they have travelled long distances in the night, when in reality they may have only travelled a max of 80 – 100 miles, if that!! Alby; Tortola was as expected – kind of strange going back there with the boat. It took 2 days to get on dock and it was a waste of time anyway as none of the work we needed got done on the boat. We did manage to do a big provision and buy a lot of food and grog as we have been told it is much cheaper in Tortola than in the Bahamas. We managed to catch up with Jim Palmer at Cooper Island while we were there which was really great. Rocket: Jim came over to the’ Melty’ for dinner and we managed to consume at least three good bottles of Australian red. David had me up at 4.30 am for the trip to San Juan, I’v never felt so seasick or was it hangover? 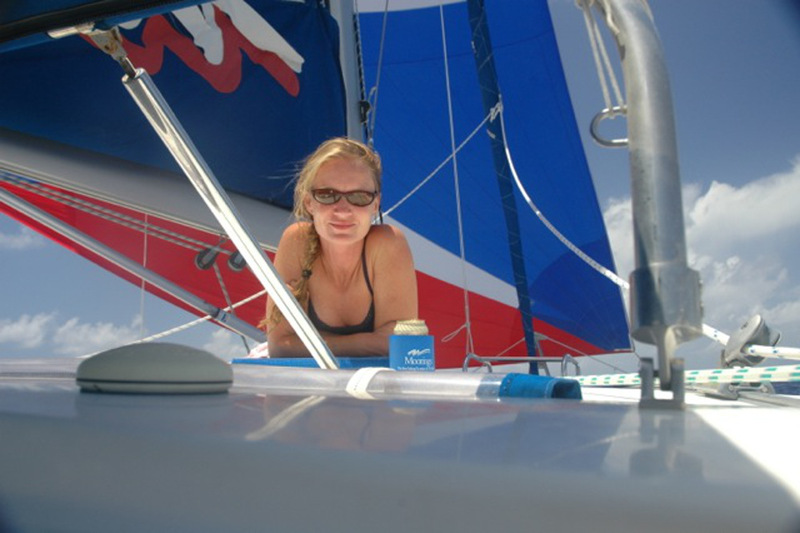 Alby: we left Tortola on the 15th of April and sailed to San Juan, the capital of Puerto Rico. Puerto Rico is a bigger island with a population of 4 million. As we sailed up along the coast it was quite exciting to see a proper city appear with hi rise buildings. lots of offices and shopping centres. We arrived in San Juan about 5.00 PM contacted customs and immigration and waited on the boat for them to arrive. We were still waiting at midday the next day. San Juan is a large commercial port and not that popular amongst cruisers so they are not really geared up for the likes of us. After much toing and froing we eventually cleared customs and were free to explore Old San Juan. Old San Juan is a truly fascinating city. Part of it is still walled with 2 really well preserved forts that date back almost 500 years. The city itself is made up of very narrow streets with very old 2 and 3 storey buildings either side. The streets are paved out of blue coble stones that came out in ships as balast. There are interesting shops and amazing little bars everywhere. The Puerto Ricans are very friendly and really know how to party. We also spent some time in newer parts of San Juan and went to a large shopping mall similar to Chadstone and the like. It was not until we got there that we realized how much we actually missed a real civilised city. Melt was amazed she wasn’t that keen on going at first, but for someone who does not like shopping it was hard to drag her away. We met a guy named Dan on a crusing boat in the harbour. He turned out to be a realy good guy and we spent some time touring around San Juan with him. We left San Juan at 4.30 pm on the 18/4. As we were passing out of the harbor we were boarded by the US Coast guard and the did a full safety check of the boat. One thing we didn’t have that they wanted to see was a Trash Management policy. They wanted to see a document that outlined the way we manage garbage disposal. I had to write one out and get him to sign it. We were planning to stop at Provodenciales which is part of the Turks and Caicos Group and about 340 miles on from San Juan. We were making really good time and we were going to arrive at Provo in the middle of the night which was not a good look for getting in through the reefs so we diverted to South Caicos and spent a night on anchor in there. We went a shore to make a phone call and the only phone there didn’t work. It was like stepping into a time warp with stray dogs everywhere. Our plan at this point was to sail 60 miles across the Caicos Bank to Provo. It has an average depth of approx 4 metres with lots of shifting sand banks and coral heads so we needed a good sunny day for this to work. After watching banks of cloud drift across and build up and the spaces of sun shine shorten we had to abandon crossing the bank. So we left South Caicos and headed in the general direction of Abaco in the Bahamas. Shortly after leaving South Caicos we got hammered by one of the most violent thunderstorms I have ever experienced. We copped over 60 knots with blinding rain and lightning all around. We had a lee shore with fringing reef and at one point we were motoring flat out and making no headway at all, fortunately it only lasted about an hour. We had planned to go to Rum Cay, but again it didn’t look like we would get there in daylight and neither of us felt like standing off for daylight so we pushed on. Late that afternoon another thunderstorm was brewing. We tried to dodge around it but had no luck and got hammered again. Not as bad as the morning but still pretty scary. We were better prepared and had all sails down before it hit. We copped a lightning strike so close that it tripped the resets on all our instruments. After this we didn’t care if we had to travel in the opposite direction to our course we managed to dodge another 3 thunder cells over the rest of our journey. We arrived in Marsh Harbor at Abaco on the 24/4 to find out that we needed Police checks and medicals to get work permits. This was a major frustration as the Police checks are taking for ever to come through from Australia. If we had been told before we got here we could have arranged them earlier. After hanging around on dock for a couple of days starting the process of getting medicals and Fed Exing requests for Police Checks back to Australia it was just about time for Freddy Haes and his mate Adrian France to arrive. We had been speaking to them about the possability of spending some time with us on the boat before we went on charter. So with Fasty and Diz on board we set out to explore the Abaco Sea which seems to have an average depth of about 3 metres. Fowl cay was the first stop for a snorkel on some realy good coral bommies in about 5 metres of water on the Atlantic side or the Cay. Lots of marine life and some really good swim throughs. From there on to Fishers Bay on Great Guana Island. This place is famous for its local beach bar on the surf side of the island called Nippers, we had a quiet drink there finding out that Sunday afternoon was the day that really went of. The following morning we sailed north to Manjack Cay and found a beautiful little bay to anchor up in on the Northern end. Great for swimming and a lovely beach to walk along. The next day was Sunday so you guessed it back to Great Guana (already nicknamed Great Goanna Island) for a Sunday drink at Nippers. There was a crowd there and all into the Rum Slushies that attack by stealth, just ask Mel. The next stop was south to Hopetown on Elbow Cay famous for its light house. They reckon the most photographed in the world. Further south to Little Harbour back on Abaco for a drink at the famous Petes Pub which is a bar right on the beach and no more than a veranderh, no floor, no walls and at dusk absolutely mosquito ridden. Beer here is US$4.00 for a stubby or can where ever you go, so we don’t spend much time in the bars, much nicer having a beer on the boat. Packaged beer from the shop is about US$40.00 a case. That was as far south as we got. On our way back to Marsh Harbour we snorkeled at Sandy Cay which was nothing short of spectacular, and anchored up for a night at Tahiti Beach which was another great swimming beach. Back at Marsh Harbour we thought we would be on charter prep. but my Police check is still not through. We loose our next charter because I cant get a work permit without a police check. So back out exploring with Fasty and Diz. Diz had to leave the next day but Fasty managed to extend his trip and help us find anchorages such as North end of Man O War Cay, Treasure Cay and of coarse we had to get back to nippers for another Rum Slushy session. This time we met some Yanks that invited us to a BBQ at a fairly nice holiday shack at Treasure Cay. You stept of the deck on to the beach that has apparently been voted into National Geographics top ten. It was a beautiful beach but I think I’ve seen 10 better in Oz. Anyway it was another good night. All this time I’ve had Fasty and Diz helping me with jobs on the boat, from polishing topsides to back flushing cooling systems. It was great to have some help. We also subscribed to a wireless internet conection which is great for keeping up with the footy scores, GO CATS, it is also good for internet telephone. Download Skype and talk over the internet computer to computer for free or dial a land line Bahamas to Oz for about 4 cents a minute (does need a strong wireless signal). Mothers day we took the lap top in the dinghy to place of better reception and we all managed to call our Mums. Amazing technology! 12/4 We are back in Marsh Harbour, Fasty left yesterday, it has been fantastic to spend some time on the boat with friends from home. The real problem we still have is no Police Report for me. It seems there are another couple of David Jeffreys around the country with serious police records, apparently one has the same birthday as me. I have had Dad chasing it up for me back home and when he got this news he actually asked me if I had been in any trouble with the Police that he didn’t know about. Any way it is getting beyond a joke, we have missed one charter and look like missing more. Each charter we miss costs us about US$1000.00 and the cops home in Oz are just saying it takes time. Melanies came back in just over 24 hours. I’ve obviously latched on to the only Melanie Anne Steeden in the world! Still no Police Check but we did get to the presentation party of a major game fishing comp. at one of the near by marinas. It was amazing, about 250 boats valued at between 1.5 and 6 mil with a few that could have been worth anything. Alot of the around the 60 ft mark with massive towers on them, 6 to 8 fishing rods each worth about 5 grand each and you should have seen there tenders. About 25ft center console with twin 300 horse Yamaha 4 strokes. One had 2 of those new 275 HP super charged Mercurys. Now I’ve never been a Merc man but they looked hot! Anyway back to the presentation. Melanie started up conversation with this guy named Jack Thulius who had a Bertram 60 (nice boat). It turned out he owned a company named Black Bart Lures. His company made most of the heavy fishing tackle all these boats were using. as it turned out his rod builder was a guy from New Castle in Oz. He said this guy was the best rod builder he had found in the world, only he was more interested in going fishing than building rods. Anyway this guy started buying us slushy rum drinks and telling us about the fishing game. It is amazing it costs around 25 or 30 grand just to enter these compsand you have to turn up with the folding stuff, no cheques or credit cards. Then those that win prizes win cash so you see blokes walking around with little black brief cases with 2 or 3 hundred grand in them. Funny game coz they spend a fortune on there boats but the marlin dont know that, so the bloke with the smallest cheapest boat can still win. It took quite a few Rum Slushies for Jack to convey all this to us so Rocket and I were pretty trashed by the time we left, in fact so trashed we both fell of our push bikes on the trip back to our Marina. Massive Hangover! Here is an adjunct from Fasty, just some of his thoughts on his time with us. Hi everyone, it’s Fred Haes (Fasty) writing a short article for Alby and Rocket’s website. I’m currently seated in “their” luxury catamaran on the last day of a fabulous 2 week holiday. Don’t know if they told you, but apparently the Moorings prohibit them referring to the yacht as “theirs”, or having any personal memorabilia on display. So while off charter, this place looks just like how you’d imagine their lounge and backyard will look like when they finish building in Metung! I took up their kind offer to visit them while they’re off charter. My old Air Force mate Adrian France (aka Diz) has come over too. He had to return a few days ago, and I’m flying out later today. The yacht is currently based in Marsh Harbour which is on the Abaco Sea, off Abaco Island, in The Bahamas. The whole sea has an average depth of 3m and the bottom is sand with some patches of seagrass. The result is that all the cruising is done in a bright, flat, shallow turquoise pool of water. When it’s calm we can clearly see the shadow of the rig on the bottom while cruising. There are a string of coral cays around the sea upon which the Yanks have splashed their spare cash into holiday homes which vary from nice homes to absolute palaces. They fly out from Miami which is only 1hr away. The houses have all the toys, and since Yanks can’t live without cable TV and high-speed internet, there are wireless internet “hotspots” all over the place. We are currently hacking into someone’s home network to get this connection and post this article on Alby and Rocket’s website! Some of the cays have fringing coral reefs and we have had a great time exploring them. The scale and variety of marine life is more stunning than the coral. Huge rays, Barracuta and Tuna combined with the usual wide variety of coral fish. We haven’t done much sailing since there’s either been not enough wind, or it’s been on the nose and we’ve felt lazy to work into it! The yacht weighs 33 tonnes but has a good sized rig on her, so she does sail quite well. I’ve never lived aboard a cat before, and will certainly find it difficult going back to living on my “little” mono back in Australia. This cat’s got air-conditioning which has made living aboard very comfortable during days of thunderstormy weather when we have had to stay inside. There is a large bimini (a canvass sunshade) over the cockpit area, so most meals and entertaining have been in the cockpit. Mel has spoilt us rotten with her range of first-class meals, cocktails etc. She’s an excellent hostess. It’s been great to help pitch in on the boat and allow her to have a break. She’s been enjoying her sleep-ins and doesn’t come out of bed until Diz and I have done the previous night’s dishes and made the first round of coffees! David has had us on the tools and with polishing rags in hand…….neither of which were in the brochure that accompanied their invitation! David is bloody good around the boat and has built on his mechanical expertise displayed during our J24 and Etchells sailing days a few years ago. He runs a great operation. We’ve had some fun giving Mel a refresher in basic navigation, using charts, D/R nav, position lines etc. she’s picked it up pretty quickly. The yacht has a comprehensive suite of nav gear aboard, so D/R nav is not really required, but Alby and I both believe in the practice of running a D/R plot to back-up the electronics in case of failure or shorting of the electronics. Not looking forward to the 24hrs of travelling to get home, or the 10hr time zone change once I get home, but the experience here makes the effort very worthwhile. It’s not often one gets an opportunity or invitation like this! Well its been a while since our last On Tour and a lot has happened. We have had distractions with the boys over here but all is good except still no police check. Any news or contact from home is always welcome.